Every company today is collecting massive amounts of business data, but is this benefiting your content marketing strategy? Oftentimes, companies will spend hours pouring over the data they’ve collected only to come up with a few tidbits of information to enhance your content. That’s hardly worth the time and resources spent. If this sounds like your organization, you’re probably wondering if the benefits of data are just a myth. Data can certainly be valuable, but it shouldn’t be your sole focus. Data is worthless if you don’t know what to do with it. Rather, content marketers should approach marketing based on the distinction between four info-gathering categories: data, information, knowledge, and narrative. Before looking at the influence of these four categories on your marketing, it’s important to first define them. Data: This is the term used to describe the raw numbers and words that a computer collects from online interactions. It’s totally disorganized and very difficult to interpret. The computer reads it just fine, but a computer can’t do your marketing for you. Information: Information is what comes when the data collected has been translated into human language. It’s the processed version of data that gives meaning, context, and shape to an idea. It can be used to help businesses make decisions and can, therefore, denote progress. Knowledge: This step comes after the information has been internalized and practiced. Humans gain knowledge when they don’t have to look at the information anymore to know how to act. Knowledge is incredibly valuable for businesses because it means identifying patterns and applying them in a creative way to do the most good. Narrative: Once the data has been collected, processed into information, and internalized as knowledge on the marketing end, it can be developed for consumer use. This comes in the form of narrative, or a story told to the consumer. Narratives have different purposes, from giving information to entertaining, but all of them are designed with the target audience in mind. For the last few years, you’ve probably heard nothing but great things about data. However, out of the four essentials listed above, data is by far the least useful for content marketing. It’s an essential component, but when it stands alone, organizations can’t do much with it. 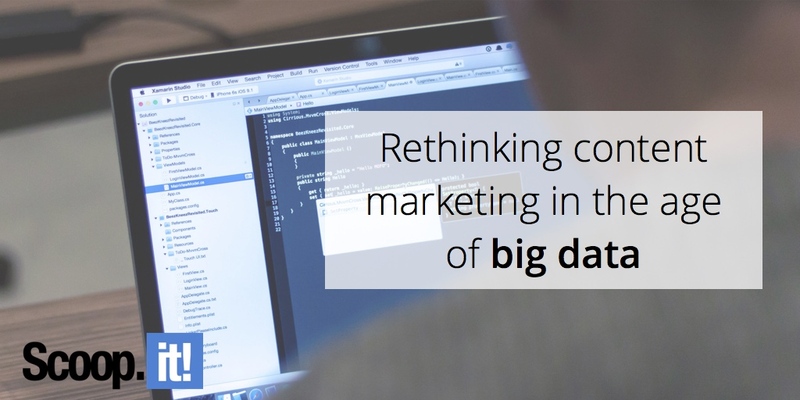 Content marketers have to understand that it’s not just about data. The numbers collected by computers are entirely useless if you don’t have information, knowledge, and narrative to carry them home. Marketers must use these building blocks to fill in the gaps and create the connections with their customers. The ability to turn data into something useful is not out of reach for any company. Content goes from data to narrative in their content marketing all the time. Oftentimes, the creators don’t even realize they’re doing it because they don’t follow patterns developed from information. Essentially, they’ve skipped the knowledge step. When developing content, it’s important to recognize the successful patterns of creating content and produce something that will convert or perform some other valuable function. Once you know how to structure and write compelling content, you can apply that pattern to all of your content. Here’s an example of an auto parts company that achieved such with their blog post. They collected a bunch of data about how certain products work, but they didn’t publish it in its raw form on their blog. Instead, they turned it into a narrative that customers could understand and apply in their lives. It started by recognizing a need. This is the first step in any content pattern. In this case, the authors recognized that many customers know very little about cars and the right tools for getting a specific job done – this blog post addresses exactly that. Then, they wrote the article in terms that are simple to understand. Their customers aren’t unintelligent by any means, but they may not know all the jargon that an experienced auto mechanic would know. Their narrative simplifies the process for them. Any company, no matter their resources, can achieve the same. By using these building blocks, marketers can easily take worthless data and turn it into valuable content for their customers. Skipping steps, however, can slow down or even reverse your progress. When you get so caught up in “data,” it becomes a drag on your company instead of a benefit. Your goal as a content marketer is to develop a system that will bring that narrative to fruition. Using the building blocks and replicating the habits and solutions of those who have come before will create a stronger database for individual companies in the future. A quintessential component of improving data use in content marketing is improving the data we have. Overall, there’s a lack of trust and understanding regarding data, and it largely has to do with the poor quality of the data collected. About 95 percent of businesses in the United States use data to meet their business goals, but not even 44 percent trust the data they collect. Capturing errors, errors in translation, or poor stewardship of data can all decrease the value of what’s collected. The process of keeping data pure is complex and difficult, so it’s no surprise that errors frequently emerge. In all, greater data quality means a focus on data cleansing, which focuses on correcting inconsistencies and other minor errors. There’s also data integration, which generally involves merging disparate databases or different data systems feeding into an integrated database. Right now, these processes typically occur following migration; however, completing these two tasks before migration is essential to increasing quality and decreasing wasted time in collection. Achieving a stronger database and implementing greater content marketing as a result will not happen overnight. Data management is an ongoing process. Many organizations have spent years trying to perfect it, but because the industry is constantly evolving, it’s difficult to find the right solution. The most important step in improving data quality is sticking to the building blocks that make it a success. As organizations interpret, internalize, and apply the data collected, they’ll get more use out of their data for content marketing purposes. It will be a slow and steady chore, but the result will be well worth the effort.